After many months of organizing, deliberation and planning, Science Communication Journal Club (#scicommjc) is finally becoming a reality. As described in the explanatory video on the Scicommjc.org home page, Science Communication Journal Club (#scicommjc ) is a monthly Twitter chat striving to be a hub for keeping up with the latest research in science communication. #scicommjc is a monthly Twitter chat striving to be a hub for keeping up with the latest research in science communication. Each month one of our volunteers will be offering a summary of a research paper, in the area of his/her speciality, by hosting a chat and writing a follow up blog post on this page. Twitter chats can follow a number of different formats, some of which we have summarized in our Ultimate guide to participating in Twitter Chats article. The format we are planning to follow is Presentation followed by Q and A. If you are new to Twitter chats or want to learn more about our discussion format I encourage your to read our guide. 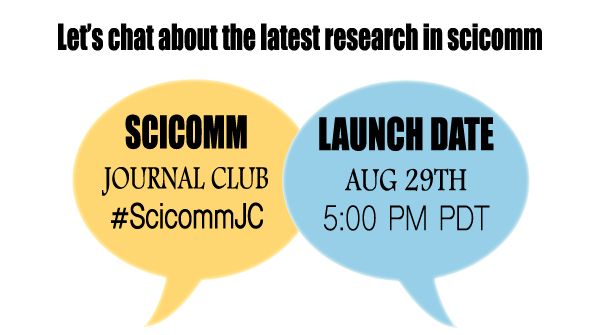 The inaugural #scicommjc Twitter chat will be held on Tuesday August 29th at 5:00 PM PDT. Sherry Nouraini will be discussing a recent PLOS article by Dr. Craig McClain entitled “Practices and promises of Facebook for science outreach: Becoming a Nerd of Trust” . Based on my Twitter conversations with Dr. McClain, we may even be lucky enough to have him join our chat and answer questions about his research. Hope you are as excited as we are and will be there.